I don't think I can stress enough how vital it is for DIY gardeners to enlist all the patience one can muster when it comes to building our own gardens. It is gradual. It takes time. It takes diligence. Some efforts are more successful than others and adjustments have to be made along the way. Even the best laid plans occasionally need to be altered. It's a lifelong endeavor after all. The best news? It CAN BE DONE. 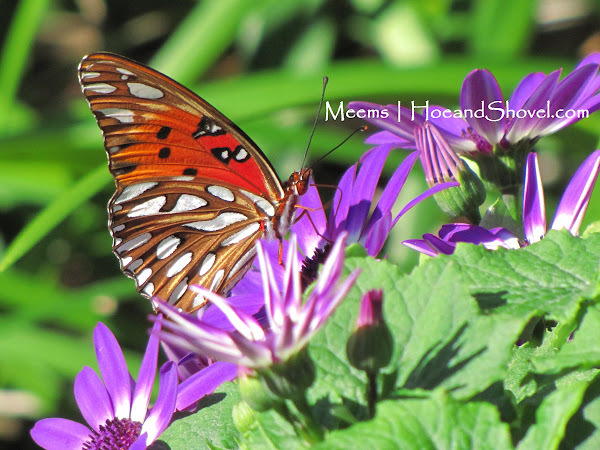 My hope in sharing my garden with you is to encourage your desire to build your garden. And to remind you it can be done no matter your level of experience. I'm basing that partly on the fact that mine has grown one planting bed at a time. Literally. I have connected the pieces as I go along. It will never be *finished*. My back yard started out as grass from front to back and side to side. You can read the history (of sorts) here in an article I wrote that chronicles the progression of the back gardens. The same methods of step by step, season by season additions apply to the front garden which you can catch up on here if you'd like a reference point for that evolution. I've written numerous times highlighting additions or expansions where I labored over digging up the grass first. You can refer back to some of those past grass-digging-and-replacing-with-plants projects here and here and here and here. And for even more backstory ... every reference to lawn removal projects here. When the water-well had to be replaced in winter 2010 it proved to be an excellent time to build the berm on the northside of the back garden. The length of it is approximately 90' and the widest part of it is approximately 18'. 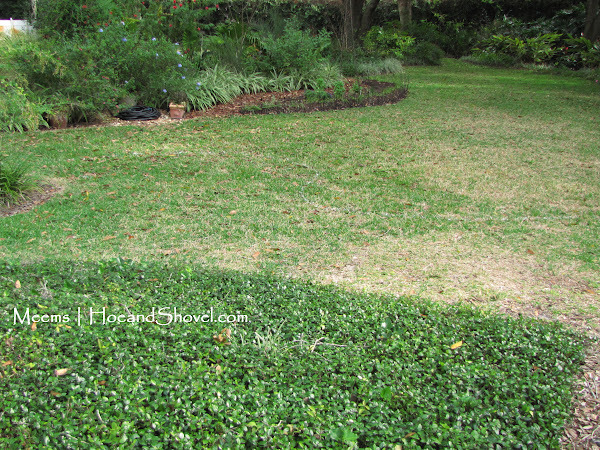 I call it a berm because it gradually rises [creating a mini-hill] to about 4' longwise down the center. 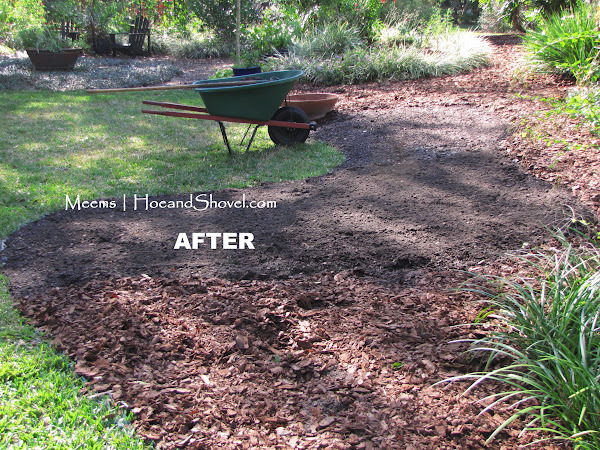 In my last post I referenced yet another tweak to the front side of the berm where I removed even more lawn. Honestly, the amount of lawn I have left is barely enough for the grandkiddos to have a decent game of backyard baseball or soccer. If it weren't for them I would remove it all. I have visions, people. I can't help myself. Taking advantage of our mild winter weather each year I dive into the 'dirt-hauling' projects while the temperatures are cooler. What you see above is looking from the northside across to southside of the back yard. The pool and the house are to the right (not visible in the photo). There were many aspects of this area that needed some improvement. You know how certain things about your garden just don't seem right? I don't let that bother me. I just keep doing what I do and eventually an idea will come to me that makes sense and with a tweak here and a tweak there makes it a better fit. At least that's the idea. 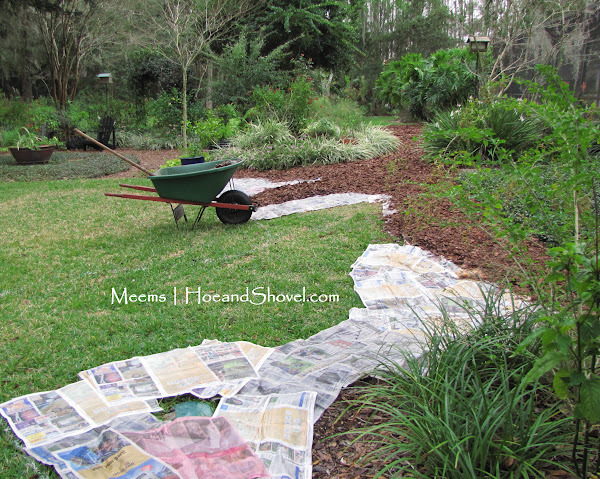 Continuing to use the layering method I explained in 10 Easy Steps :: Making a New Planting Bed I thought long and hard about how to extend this planting area. It is a well used area for foot traffic. There are entry points from every direction that are necessary to avoid blocking. 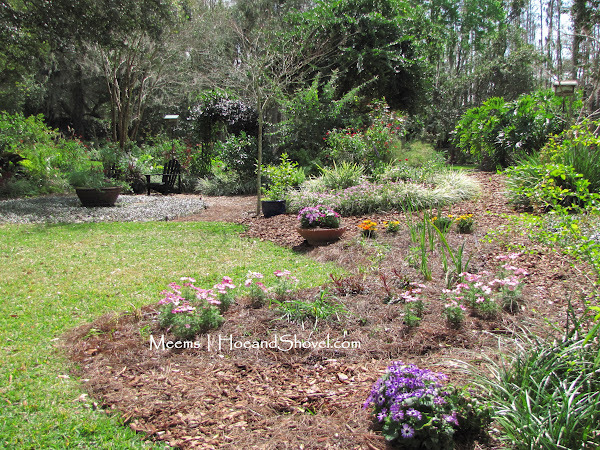 The mulched area is the space left to be used as a pathway. The ground slopes down a little here away from the back patio area. The area with dirt is what I planted out. I purchased a few plants such as gazania, gaura, and cosmos but the rest of what I chose for this sunny spot came from my garden or seeds. 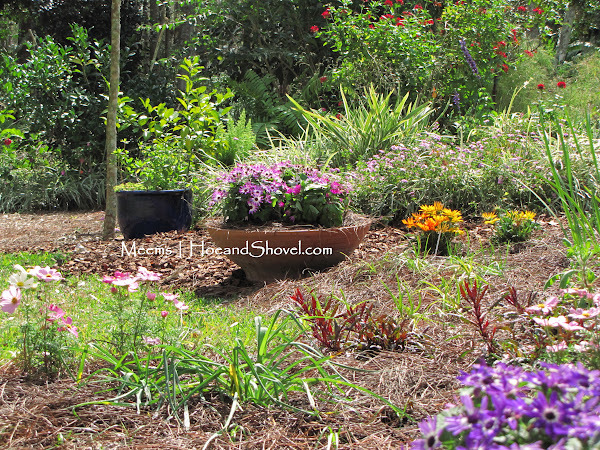 Dividing existing plants is an easy and inexpensive way to continue to build a garden. I tend to spend more money on the foundation than the pretties. Good soil, compost, and organic amendments to give the planting it's best chance for success is priority. The pretties are sure to come when the foundation is laid properly. Adding a few inexpensive annuals gives me enough initial satisfaction while I patiently wait for the perennials to take root and fill in. The wider view shows how this new area fits in with the view to the circle garden and beyond. The new planting faces east but gets quite a good dose of mid-day sunshine. Not very many opportunities for that in my mostly shady garden. As usual, with thoughts of mixing natives together with great Florida-Friendly choices I made my selections of what to blend together. 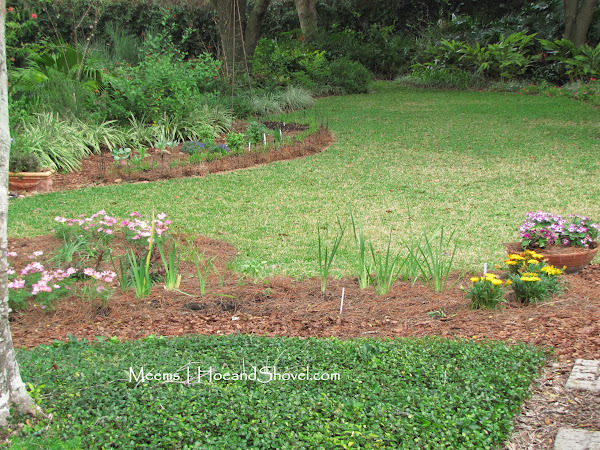 Divisions of Louisiana iris, spiderwort, blue-eyed grass, stokesia, bulbine, gaillardia and African iris will spread out and take up the space as spring/summer lends a sunny hand. 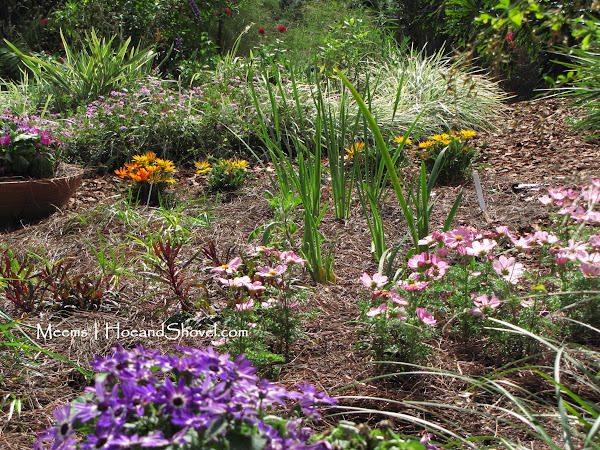 Seeds of zinnia and coreopsis will assist in a meadowy feel with a splash of wildflower appeal. 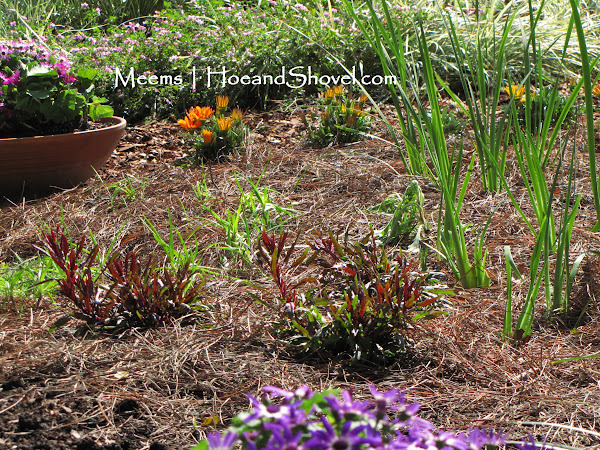 Have I mentioned how much I love using pine straw for newly planted and seeded beds? It is light and airy and allows the seeds room to breathe while still protecting the soil from drying out too fast. Yummy stuff. A thicker layer can be added as growth progresses. The view from the back patio looking to the northeast in the back garden. You can see the last winter project in front of the berm. Here it is with both projects completed. There you have it. One more immature planting bed added to the garden. While the rest of the garden has its foundations settled into place long ago and digging roots down deeper each year I'll have fun nurturing more babies. You can do it, too! One step at a time! It's what makes growing a garden one of the most rewarding aspects of life. 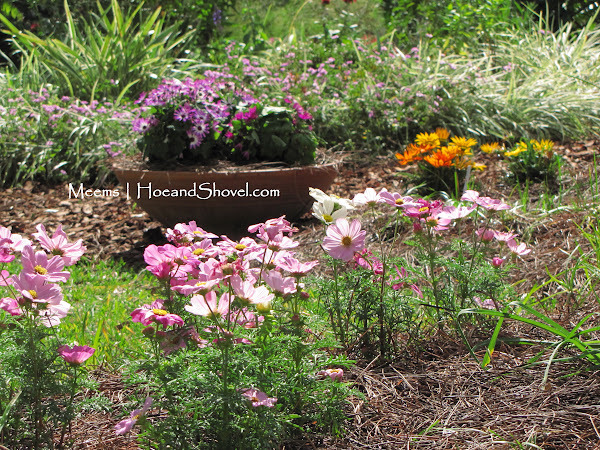 What are your plans for spring projects or for tweaking your garden? 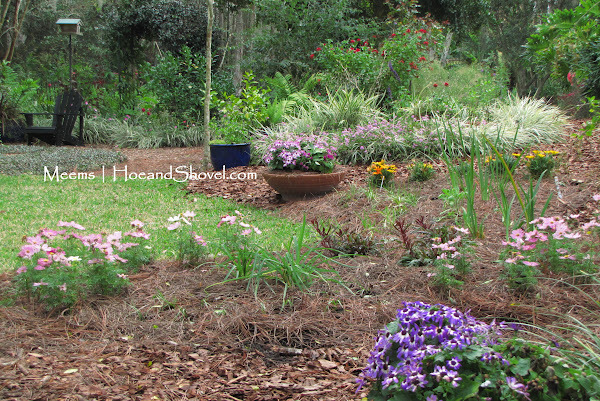 Speaking of winter projects... my latest Lowe's article is posted. It highlights another long pathway I built in December and January. You know what that means? Even more grass is bye-bye. I like the idea of creating a path between the beds like you have done here. Does the pine straw make your soil very acidic? I remember using it extensively when I lived in Jacksonville. My neighbor wanted me to cut down some of my pine trees, and I looked at them as my mulch providers. Great informative post. Here at my place living on a rocky hillside presents its own set of problems and it's a real challenge to create new garden beds. At the moment I'm happy with the bones but the next stage will be the filling in underneath the trees and shrubs. Gardening is indeed an on-going challenge that provides such brilliant rewards. 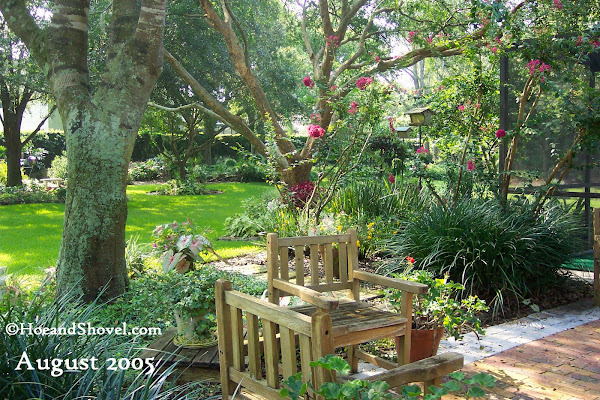 Your garden is an inspiration for me and something I aspire to creating one day. What a great post! It is really inspiring to read about and see your progress through the years. Our neighbors have a black oak tree that is depositing leaves into our side yard and I'm wondering if I can use those leaves for mulch. They are small leaves, but maybe they are acidic. Have a great week and enjoy your wonderful gardens, old and new. Hi Meems, i still remember the looks of you past posts, and i am reminded that when i will be asked what garden i love, i said 'one of them is Meems'. The lushly growing foliage and caladiums are still vibrantly colored in my brain. Now i am waiting for all the lushness and blooms to come up again. I love seeing your before and after photos Meems. It really gives me encouragement. I wish I had taken more of the before. I did take some but it was before digital photos. Not so much picture taking back then. Great explanation, Meems. Have you ever considered teaching a class through the extension center? I would be first to sign up! Thanks, as always, for the inspiration. I am working on feeding the beds before planting and dividing up some of our plants. This is a remarkable garden, and I love that you have tackled it bit by bit. Sitting looking out at a bare back yard and understanding that I am not going to be able to transform it all at once relieves me. 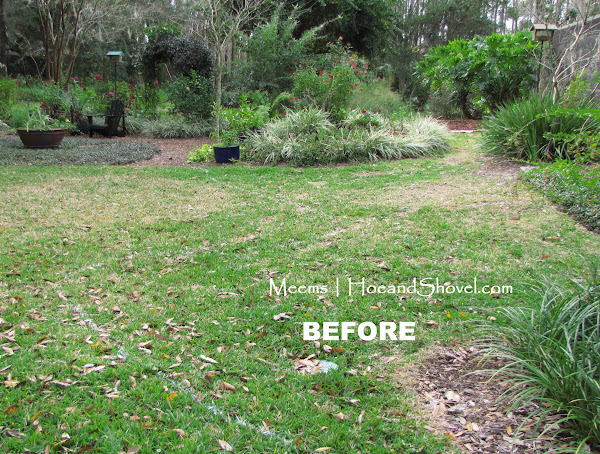 I love seeing how you have transformed this area and the line of your new beds. It looks so lovely Meems. So nice to look back at old pics to see how far the garden has come. 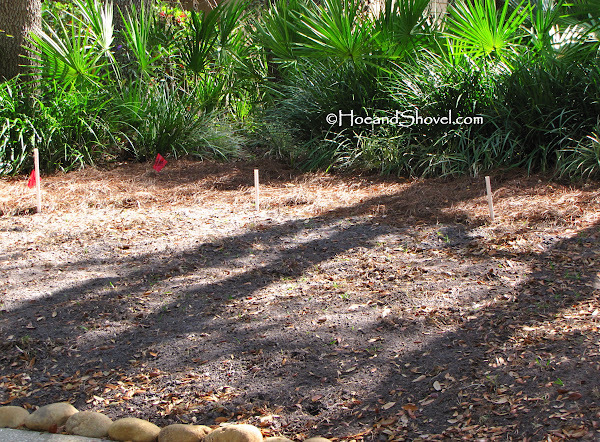 Building a garden definitely takes patience but is worth every bit of effort. Great encouragement to others to keep at it.